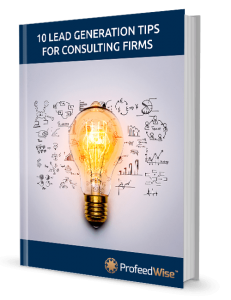 Are you looking to generate fresh leads for your consulting business? Fresh leads are key to the survival of any consultancy business. Consultants must ensure there are continual new leads available to work upon and sell to. It can take just 2-3 months of losses, or even less, to bring a consulting firm down. In this free ebook, we have detailed the techniques our network has used through our platform, to help consulting firms all over the world increase their business. Fill out the form on the right and receive this ebook via email.